Wilhelm Liebknecht, the son of Katharina Elisabeth Henrietta and Ludwig Christian Liebknecht, was born in Gießen on 29th March, 1826. His parents died when he was a child and he was raised by relatives. He went to a local school before studying philology, theology and philosophy in Berlin and Marburg. In 1847 he became a teacher of a progressive school in Zurich. Later that year a civil war erupted in Switzerland. He sent eyewitness reports to the German newspaper, The Mannheimer Abendzeitung. Liebknecht now decided to become a journalist. He went to Paris in 1848 to report on the uprising. He then moved onto Germany but was arrested in Baden and charged with treason. However, a mob secured his release. He escaped to Switzerland and became a leading member of the Worker's Association in Geneva. Now a committed revolutionary, Liebknecht activities eventually got him banished from the country. 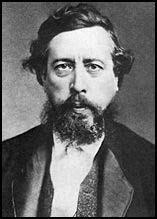 In 1850 Liebknecht moved to London, where he associated with other socialists such as Karl Marx, Friedrich Engels, George Julian Harney, Ernest Jones and Robert Owen. Liebknecht, Marx and Engels became members of the Communist League. He later recalled: "During the thirteen years I spent in England I learnt to know the English workers and to love them. Far from looking askant at the foreigner, they have, on the contrary, a considerate sympathy with him, which seemed to me not infrequently excessive... The great heart of the English workers has never failed. Wherever there has been fighting for the cause of labour and humanity, there were the true, sincere, and, where need was, the practical sympathies of the English workers." After the amnesty for the participants in the revolution of 1848, Liebknecht moved back to Germany and joined the General German Workers' Association (ADAV), that had been formed by Ferdinand Lassalle. Liebknecht moved to Leipzig where he met August Bebel. The two men became close friends. Bebel later recalled: "Liebknecht’s genuine fighter’s nature was keyed up by an impregnable optimism, without which no great aim can be accomplished. No blow that struck him, personally or the party, could rob him for a minute of his courage or of his composure. Nothing took him unawares; he always knew a way out. Against the attacks of his antagonists his watchword was: Meet one rascal by one and a half. He was harsh and ruthless against our opponents, but always a good comrade to his friends and associates, ever trying to smooth over existing difficulties." Over the next few years the worked together in an effort to spread the ideas of Karl Marx. In 1868 he won a seat in the Reichstag. In his book, On The Political Position of Social-Democracy (1869), he explained: "The question as to what position Social-Democracy should occupy in the political fight, can be answered easily and confidently if we clearly understand that socialism and democracy are inseparable. Socialism and democracy are not identical, but they are simply different expressions of the same principle; they belong together, supplement each other, and one can never be incompatible with the other. Socialism without democracy is pseudo-socialism, just as democracy without socialism is pseudo-democracy. The democratic state is the only feasible form for a society organized on a socialist basis.... We call ourselves Social-Democrats, because we have understood that democracy and socialism are inseparable. Our programme is implied in this name. But a programme is not designed to be given merely lip-service and to be repudiated in action. It should be the standard which determines our conduct." In 1869 Liebknecht and August Bebel formed the Social Democratic Workers' Party of Germany (SDAP) together. They also established a newspaper, Der Volksstaat. In 1870 the two men used the newspaper to promote the idea that Otto von Bismarck had provoked France into war and called on workers from both countries to unite in overthrowing the ruling class. As a result, Bebel and Liebknecht were arrested and charged with high treason. In 1872, both men were convicted and sentenced to two years in the Königstein Fortress. On his release in 1874 Liebknecht was once again elected to the Reichstag. The following year he helped the SDAP merge with the General German Workers' Association (ADAV), an organisation led by Ferdinand Lassalle, to form the Social Democratic Party (SDP). In the 1877 General Election in Germany the SDP won 12 seats. This worried Otto von Bismarck, and in 1878 he introduced an anti-socialist law which banned Social Democratic Party meetings and publications. Paul Frölich was a member of SDP who was critical of Liebknecht's leadership. He argued: "In the German social-democratic movement the policy of repudiating the use of violence in the political struggle had become practically a dogma. Wilhelm Liebknecht, whose tongue often enough ran ahead of his ideas, had once declared that violence only served reactionary ends - a remark which was repeated with gusto on every possible occasion." After the anti-socialist law ceased to operate in 1890, the SDP grew rapidly. However, Liebknecht and August Bebel had problems with divisions in the party. Eduard Bernstein, a member of the SDP, who had been living in London, became convinced that the best way to obtain socialism in an industrialized country was through trade union activity and parliamentary politics. He published a series of articles where he argued that the predictions made by Karl Marx about the development of capitalism had not come true. He pointed out that the real wages of workers had risen and the polarization of classes between an oppressed proletariat and capitalist, had not materialized. Nor had capital become concentrated in fewer hands. Bernstein's revisionist views appeared in his extremely influential book Evolutionary Socialism (1899). His analysis of modern capitalism undermined the claims that Marxism was a science and upset leading revolutionaries such as Vladimir Lenin and Leon Trotsky. Liebknecht also had trouble from the left of the SDP. He came into conflict with Rosa Luxemburg over her militant articles in Vorwarts. Her biographer, Paul Frölich, has pointed out in his book, Rosa Luxemburg: Her Life and Work (1940): "When Luxemburg published her articles on the Oriental question, even old Wilhelm Liebknecht set upon her with a letter which failed to refute any of her arguments, but which let fly at her a whole quiver of choice invectives, going so far as to make the scarcely veiled accusation that she had been bought by the Russian Okhrana - an action which, somewhat later, the old man admitted to be wrong and regretted." Wilhelm Liebknecht died in Charlottenburg on 7th August 1900. Liebknecht had returned to Berlin in the summer of 1862, after an exile of thirteen years. The amnesty of 1860 made this possible for him. He followed the call of the old revolutionist, August Brass, with whom he became acquainted, like Engels, in Switzerland, and who had founded a Greater German democratic newspaper, the Norddeutsche Allgemeine Zeitung, in the summer of 1862, in Berlin. Liebknecht had been won, together with Robert Schweichel; for the editorship, the former for foreign politics. But when Bismarck assumed the ministry at the end of September, 1862, both of them soon discovered that something was wrong. Their suspicions were confirmed, when one day an accident would have it that Schweichel received a letter for Brass from a messenger of the ministry, who said that the contents of the letter were to be published at once. Both of them gave notice and resigned from the editorship. As Liebknecht declared publicly, later on, Lassalle upbraided him, even one year after his resignation, for leaving left his position on the “Norddeutsche Allgemeine Zeitung.” Liebknecht, who then had a wife and two children, whom he had summoned from London to Berlin, meanwhile earned a living as a correspondent for various papers. When I became acquainted with him, he wrote, among others, for the “Oberrheinischen Kurier,” in Freiburg, Baden, for Rechbauer’s democratic “Tagespost,” in Graz, and for the “Deutsche Wochenblatt,” in Mannheim, from which last named, however, he could not have received very much. Later he wrote for several years for the “Frankfurter Zeitung.” He gave public lectures in Berlin, particularly in the printers’ and tailors’ unions, also in public labor meetings and other popular meetings, in which he combatted Bismarck’s policies. He regarded JB von Schweitzer, the editor of the “Social-democrat,” as the stool pigeon of those policies. The question as to what position Social-Democracy should occupy in the political fight, can be answered easily and confidently if we clearly understand that socialism and democracy are inseparable. Socialism and democracy are not identical, but they are simply different expressions of the same principle; they belong together, supplement each other, and one can never be incompatible with the other. Socialism without democracy is pseudo-socialism, just as democracy without socialism is pseudo-democracy. The democratic state is the only feasible form for a society organized on a socialist basis.... We call ourselves Social-Democrats, because we have understood that democracy and socialism are inseparable. Our programme is implied in this name. But a programme is not designed to be given merely lip-service and to be repudiated in action. It should be the standard which determines our conduct. The industrial development of England is in advance of that of Germany by many years. In Germany business on a large capitalistic scale, modern capitalism, is only about fifty years old. Thanks to this early economic maturity, by the second-third of the last century - more than twenty years before the French Revolution - the character of the modern workers’ movement had been thus early impressed upon the English workers’ movement, which, even in mediaeval times was characterised by forcible resistance to the “masters.” Hence the English language does not know a workers’, but only a working-class movement. If, then, I must give the credit of this to the English workers’ movement itself, yet to the author belongs by her choice of the title, “The Working-class Movement in England” instead of “The English Working-class Movement,” the incontestable merit of placing in the foreground the International nature of the workers’ movement. And I lay the more stress on this as the English workers are, without reason and very unjustly, given a character for national narrow-mindedness and selfishness. The English are made up of contradictions - contradictions that are, undoubtedly, more apparent than real. Their insular exclusiveness - in some cases so marked that it reminds one of China - is in contrast to the cosmopolitan spirit, which looks out from the little island, ruler of the seas, over the trade and commerce of the world and lifts England to the highest height of cosmopolitan humanity. When, after the crash of 1849, we exiles anchored in England, at first we wondered greatly that in the capital of a people that go about the world more than any others and do more business than any others with all nations in the world, a felt hat or a beard not exactly in harmony with English models led to a crowd in the street. But, as soon as we came in contact with these very people who behave so like Chinese, and got to know them better, we were astonished at the friendly interest they took in us. And among the workers, at that time shaken by the after effects of the storm of the Chartist movement, we found always an understanding and inspiring sympathy. During the thirteen years I spent in England I learnt to know the English workers and to love them. Far from looking askant at the foreigner, they have, on the contrary, a considerate sympathy with him, which seemed to me not infrequently excessive. How often have the English workers said to me, apologetically, “Politically we are, alas! far behind the French and Germans.” By this they meant that in 1848 they had not managed a “revolution” in England. And they forgot that in England they had already got beyond that sort of spectacular drama. Only the romantic side of revolution has something dazzling about it, and that side is wanting in the English. Not that they are, by any means, incapable of enthusiasm. I shall never forget the passionate enthusiasm of Julian Harney’s and Ernest Jones’s last Chartist meetings, and the mass meeting on Robert Owen’s eightieth birthday. We have accustomed ourselves to consider the English, because the material and realistic effects of capitalism came out earlier and more clearly among them, as human machines compared with us, as a sort of automata, passionless, without emotion. That is a very superficial idea. We must not forget that the English are the people of Byron and of Shakespeare, and that no working class of any nation has rebelled against capitalism so obstinately, so heroically, as the English workers. The history of the English workers is the history of an unbroken struggle for the rights of labour, for the rights of the workers as men and women. The political and economic history of England explains to us the political and economic significance of the present, and to some extent shows us, “as in a glass darkly,” the future. And, in like manner, the history of the working class of England is a sure guarantee that the working class which suffered and is suffering so frightfully under capitalism has also the power and ability to overthrow capitalism. The old cry of “No surrender” is that of the English working class to-day, as it was five hundred years ago. The battle is to the death and to victory. The great heart of the English workers has never failed. Wherever there has been fighting for the cause of labour and humanity, there were the true, sincere, and, where need was, the practical sympathies of the English workers. Nothing can be more unworthy and at the same time more stupid than the assertion of the German mercenaries of the capitalists, that “when the English support strikes on the Continent, they do it only with the interested idea of injuring foreign and helping English industry.” These English workers as will be shown in the historical sketch which follows - during the American blockade at the time of the Civil War between the North and South, bore cheerfully the most extreme privations and bitter hunger, and victoriously resisted the reactionary attempts made to incite them to agitation against the American Union and the cause of the emancipation of the slaves.